The magnetic bit holder made of neodymium is perfectly suitable for inserting, holding and extracting bits with one hand - even when wearing work gloves. Bitpass easily adjusts to your forearm. Thanks to its wide adjustment range, the robust Velcro strap can be worn even on top of an overall sleeve. It is comfortable and ultra-light (only 75 g with 6 bits) - you'll soon forget you are wearing it. Bitpass can also be very easily attached to your screwdriver. 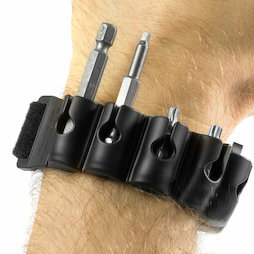 The strap is adjustable to your needs without having to open up the whole gear. 1 pc. 17,95 EUR ea. Bitpass is unique thanks to its magnetic system and sideways extraction. The video shows all the features of the Bitpass. Not for nothing, the magnetic bit holder won already three gold medals at inventor fairs. The Bitpass is especially designed for the needs of building professionals. At a construction site, installation and assembly happens in all sorts of positions - standing, sitting, squatting, on your stomach - and often in hard to reach places, during rain or snow. Wouldn't it be convenient to change a bit without having to let go of everything or take off your gloves? It's easy with a Bitpass! Put the 6 bits that you use the most into your new bit holder, and you will no longer lose time looking for bits in your pockets and enhance your comfort and convenience. The edges of the individual bit holders are flared, cone-shaped and slanted to facilitate an easier insertion of the bits. The bits themselves are held in place with a strong magnetic system at the bottom. The inner side of the strap is wavy, so the skin can breathe. Bitpass does not have sharp edges, which protects delicate material from scratches. Bitpass was developed and fabricated in Europe and is made of the hypoallergenic plastic TPU.